available in Madhya Pradesh Vyapam are 1021 posts. available vacancy details are mentioned below. i. Sub Engineer (Civil): 661 posts. ii. Sub Engineer (Electrical): 128 posts. iii. Sub Engineer-Mechanical - 22 posts. iv. Assistant Draughtsman: 02 post. vi. Sub Engineer / Investigator / Quantity Surveyor: 01 post. viii. Sub Engineer (Electricals & Electronics): 14 posts. xi. Mineral Surveyor: 04 post. xiii. Sub Engineer - Assistant Sub Engineer Civil - 03 posts. consists of 100 questions for 200 marks. Science, General Computer Knowledge, Basic Maths and General Knowledge. must have qualified 03 years diploma in Agriculture/ Civil Engineering. have completed ITI in Draughtsman, Diploma in Civil. have completed ITI in Surveyor Trade/ Civil Diploma also Eligible. for Sub Engineer Jobs is Rs. 9,300/- to Rs. 34,800/- plus grade pay of Rs. Female/Reserved candidates is 45 years applicable as per Govt Norms. form using the Official web link @ www.vyapam.nic.in by online mode. 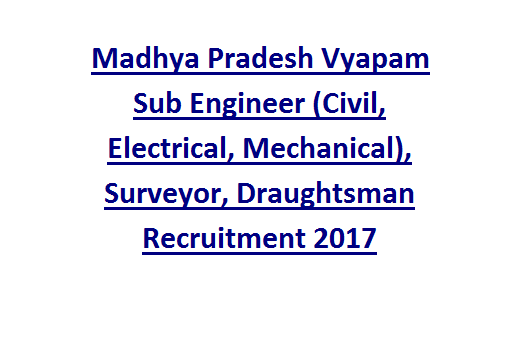 Apply online for the Madhya Pradesh Vyapam Sub Engineers, Surveyor, Draughtsman Jobs Recruitment2017.